An apt illustration of the mutual symbiosis between Buddhism and Hinduism, the holy shrine Muktinath Temple accompanied with the meaning ‘God of Salvation’ is continually holding a high significance for the divinity seekers. It is believed by the Hindus that Lord Vishnu experienced the attainment of Mukti i.e. salvation from the curse that he perceived from Brinda who is known to be the wife of Jalandhar leading to him being worshipped as the ‘Lord of Salvation’ in the Muktinath Temple. Whereas on the other hand, the Buddhists hold a high spiritual association with this hub as according to them, the Tibetan Buddhism’s founder i.e. Guru Rinpoche after spending abundant days while meditating in the Muktinath attained the spiritual knowledge for lifetime. This spiritual hub is witnessed to be the one that has arisen on its own and is also amongst the eight such shrines named as Srirangam, Thottadri, Pushkaram, Naimisaranyam, Sri Mushnam, Pushkaram and Tirupati. Apart from this, the Muktinath Temple is also counted amongst 108 Vaishnava shrines. Established in the 19th century, this destination is consecrated by the Hindus where you can just sit in a serenity filled environment and stare the snow-covered Annapurna range clipped in the south as well as the Tibetan Plateau in the north for hours. The derivation of the word ‘Muktinath’ is facilitated from ‘Mukti’ and ‘Nath’ with Mukti denoting ‘Salvation or the Nirvana’ whereas Nath denoting ‘God or Master’. The temple holds a special place in the hearts of Hindus and especially for the devotees belonging to the south Asian sub-continent. The Muktinath Temple is situated at an elevation of 3,610 meters (11,872 feet) at the Thorong La mountain pass’s district and is worldly prominent as a massively venerated place for both the Hindus and the Buddhists. While being present here, one shall witness a semi-circular shaped wall incorporating 108 stone faucets at an altitude of approximately 7 ft. situated just behind the temple. These faucets resemble the head of a bull and are exactly the same shape as the others with a distance of 1 ft. between them. The mouths of these bulls pave the way for drawing the ice-cold water of the Kali Gantaki River. Taking the bath with this water has been proved as an act of attaining the utmost salvation. Ardent followers from all over the world are intending to visit the Muktinath Temple with the sole intention of attaining the Nirvana. The most favoured attractions of the pious Muktinath temple include the Muktidahara, Kunda, Gomba, Jwalamai Temple, Sri Murthy Mahatma, Swaminarayan, Shaligrama and not to forget the Gomba Samba. As notified by the Hindu mythology, the world is seen as a ‘MAYA’ i.e. an illusion inculcating the cycle of rebirth and birth and visiting the Muktinath Temple shall help the divinity seekers get rid of this cycle and undertake the Nirvana. Hindus assume that one should obviously visit the Muktinath temple after completion of the pilgrimage tour of four prominent religious sites also known as the Char Dham Yatra. The temple is tucked in amongst the grove of trees and contains the Pagoda styled Vishnu temple as well as the Buddhist Gompa. This spiritual destination carries different names by the people of distinct regions including the South Indians who call it as the ‘Muktidham’ and find it compulsory to explore the divinity lying here at least once in their lifetime. Although it is small in size but the religious relevance carried by it is no less than an utmost satisfaction for thousands. Mentioning about the statue of Lord Vishnu inside this establishment, it has been confirmed that it is made up of gold and its height can be easily compared to that of a man. Once the devotees are done with the prayer ceremonies in the Muktinath Temple, they can head towards the Mebar Lha Gomba that is a small sized monastery of `miraculous fire' located at the temple’s entry gate. It is majorly prominent for the existence of the ‘Jwala Mai’ (as the Hindus name it) - endlessly burning natural gas fire as well as a statue of the Buddhist deity Chenrezig (Avalokitesvara). The visitors here are truly going to witness the presence of an old Buddhist monk in the Muktinath temple who is worshipped by the Buddhist nuns. The Shaligram stones covering the entire river bed are providing a great assistance in the worshipping rituals of Lord Vishnu and also it is highly recommended not to click any photographs or make any videos of the deities inside the Muktinath temple. The most perfect time for planning your expedition to the holy Muktinath temple stands out to be none other than the period between March to June, and September to November. This is because travelling here in other months shall lead to some weather issues and your journey to the Muktinath Temple is surely going to be the one filled with an array of archaeological sites and exotic temples. Travelling to the Muktinath temple is not at all an easy task as the weather conditions here can be quite non-cooperative at times. However, for those who are able to pass through the arid conditions can surely head towards planning their trip here and some of the most used routes to reach the Muktinath are via Gorakhpur, Bhairawa, Pokhara and Sonauli along with varied others. 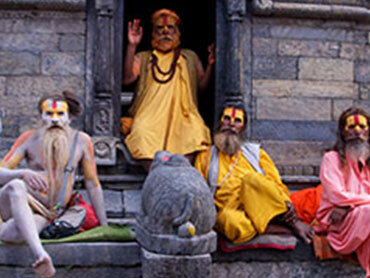 You can have Muktinath temple darshan from Kathmandu airport by a chartered helicopter. A flight takes 1 hour 30 minutes one side takes you to Muktinath temple from Kathmandu and after performing puja at the temple you can travel back to Kathmandu to Pokhara with the same chartered helicopter. Helicopter charter service is available at Kathmandu for both side trip. One helicopter can take five to six passenger one time. So if you are a family of group of about five people you may take a helicopter yatra from Kathmandu by a chartered private helicopter. Muktinath darshan tour package by private helicopter is expensive affair but this is the best way to get Muktinath temple and return back to Kathmandu quickly without any long drive of flight connection. 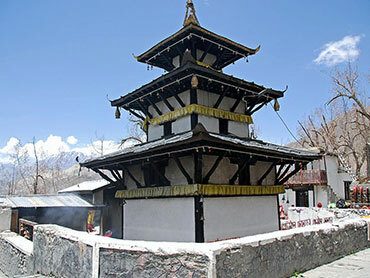 Muktinath darshan tour by road from Kathmandu is a convenient and cost effective way to visit the temple. A drive of about 200 kms from Kathmandu to Pokhara takes about 6 to 7 hours where you halt for one night before traveling to Muktinath. Next morning depending on weather condition a 15-20 minutes flight will take you to Jomsom from where one has to take a hike for about half an hour to reach the jeep station. A half an hour drive from Jomsom will take you to Muktinath. To reach the main temple one has to take half an hour hike or a horse ride. After darshan at Muktinath temple and performing puja one has to stay at Jomsom and wait for the next morning to board flight back to Pokhara. At Pokhara either you stay at a resort and enjoy your time or board a connecting flight to Kathmandu. The road travel from Kathmandu to Muktinath is a challenging and time taking affair due to road conditions. Take a 6 to 7 hours drive from Kathmandu to Pokhara. Stay at Pokhara for the night and next morning continue your 10 hours long drive (170 kms only) to Jomsom crossing Ulleri, Ghorepani, Tatopani, Ghasa Larjung and Kagbeni. A drive from Pokhara to Jomsom is considered to be a tough ride as the veicle has to pass through curvy edges in high and rough mountains, unpaved roads and steep mountains. However from Kagbeni to Muktinath road has been black topped and has become comfortable now. Regular flights operate from Kathmandu to Pokhara and connect with flight from Pokhara to Jomsom. A flight for 25 minutes takes you to Pokhara from Kathmandu where after staying for one night you can connect with flight to Jomsom. The flights from Kathmandu starts at around 9am. The flights from Pokhara takes off to Jomsom early morning only therefore a night stay at Pokhara is required before flying to Jomsom. After arriving at Jomsom airport hike to jeep station for half an hour and take half an hour drive to Muktinath. Next half an hour hike (or horse ride) takes you to Muktinath Temple. Perform puja at Muktinath Temple and stay at Jomsom for the night. Next morning take early flight to Pokhara and connect with flight to Kathmandu. This trip needs usually minimum one night stay at Pokhara and one night at Jomsom.